The manager automatically checks the newest firmware on the server. Please be sure to connect your PC to the the server. 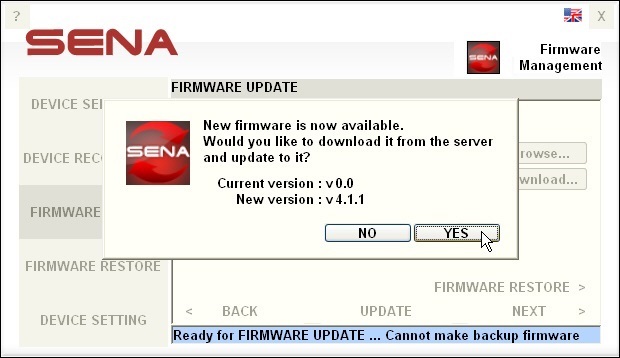 If there is a newer version firmware on the server, following message will be displayed. 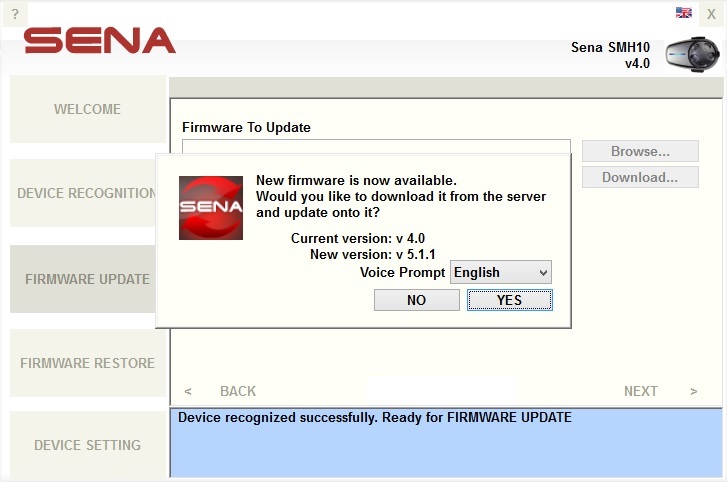 : downloads latest firmware and update device with it. : closes message box without updating. : select the voice prompt. If the manager fails to connect to the server, it will not show information of the latest version firmware and users will not be able to download the latest version. NOTE : NEVER unplug the USB cable, NEVER turn off the device and NEVER stop the manager during firmware update to avoid firmware corruption. In the case of device in firmware management mode, the manager cannot display the information of the device connected to the PC. It can neither configure the device setting nor make backup firmware information file on updating firmware. 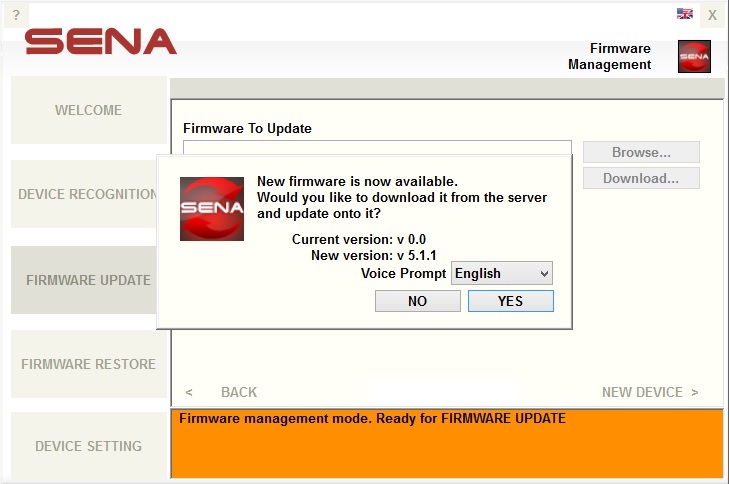 : specifies the firmware to update by browsing or downloading firmware. : pops up the [Open File] screen to select the firmware on the local PC. The selected file is displayed at the [Firmware To Update :] text field. : displays information of the latest firmware version of the device. : pops up the [Save File] screen to save the latest firmware on the local PC. The saved file is displayed at the [Firmware To Update :] text field. : starts updating firmware with the firmware file specified at the [Firmware To Update :] text field. : opens the [Firmware restore] page. : opens the [Device setting] page. : opens the [Device recognition] page. 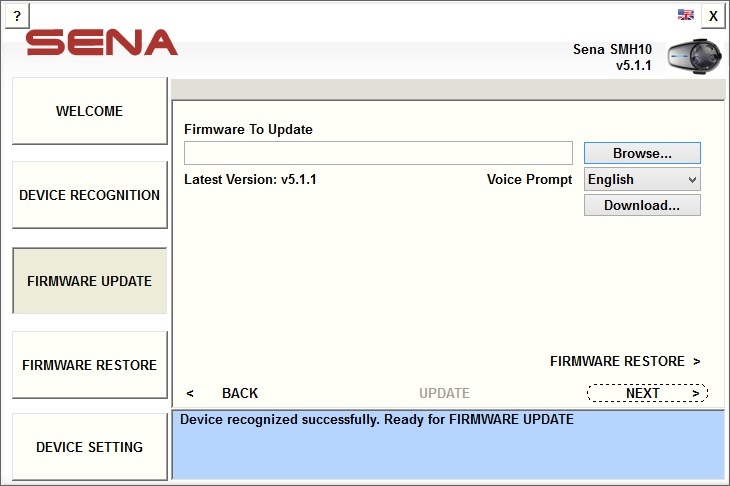 Recognizing device after successfully updating firmware. Displaying the [Firmware update] page with information of device with new firmware.